I got ZBrush 4.0 today, and as I no longer even bother keeping a windows install on my machine, I was a little worried about how well it would work on my ubuntu 10.10 install using wine. Whilst Wine HQ had listings for zbrush 3.5, I was not able to find details of anyone successfully running zbrush 4.0 on wine. Undeterred, I made sure I was using an up to date version of wine (1.2.1 stable) and ran the installer. The installer worked perfectly! First step complete. Browsing wine’s C: drive to the above location I noted that the \Tempfiles folder was missing. However simply creating the directory (no need to worry about search.mem) and re-launching zbrush seemed to fix this, and since then zbrush has been working great (though I still get the first error message on stasrtup). So far I’ve tested saving and loading, zshpere sketching, sculpting, shadowbox, import and export, quick sketch, and polypainting and I haven’t had any trouble. The only other problem I’ve come across so far is that attempting to minimise zbrush causes it to become unresponsive (though I can still quit normally, and even save the open document, but unfortunately not the current ztool). I find shifting it off to another workspace is enough of a reminder to stop me doing this though, so it’s not a major issue. I’m still going through all the features and testing things out/remembering what all the buttons do (it’s been a while since I last used zbrush). I’ll update this post if I come across any issues. I’ve also added my test data to wineHQ. Edit: Lightbox does not appear to correctly detect image files or sculpting alphas as far as I can tell, though it will recognise zbrush tools and documents, and matcap materials. This is great to hear, i was thinking of buying and running zbrush under wine too. I hope you won’t find any more bugs then! Same problem I have when i got in Win XP sp1.Its look likes if you run Zbrush in win xP sp1 then you must install to xp sp2. and the problem dissappear. I think is the windows explorer in Sp2 has an Upgrade version..
Well I do need help! I have a different problem..
Hmm, I’ve not had that problem myself. Win Tab Services sounds like tablet input for wine or something, but I’m not sure. Maybe try and make sure your tablet is all set up and working first. Also do report it to the wineHQ bug tracker, as it may be something they can fix. WinTab error is a royal pain. Basically the emulator believes that there is a tablet plugged in (even if there isn’t), but hangs because the lack of a driver. Unfortunately it freezes the application. Current advice is to unplug all peripheries in case wine is reading one of them as a tablet and try again. If that doesn’t work then in windows it would be go to device manager and delete the phantom tablet device from there. Sadly, that’s not an option in wine. Even windows users have this problem, although it seems to be a rare one. Although in extreme cases a reinstall of windows needs to be done. I have had the message where I have been able to just turn it off and continue, but I have also had it when it has frozen the app. Am going for another install as I would rather eat a kangaroos **** than throw my laptop back into the quagmire called windows. I have the win tab problem runing zbrush 4r4 in Ubuntu 13.10, you can splein better how can I do wat you say hear. I don,t no were is the command line. I’m afraid I’m not too up to date with the issue any more – I’m not currently running a Linux system. I suggest you try looking over at WineHQ. Hey I wanted to let you know that ZBrush 4R2 mostly works under Wine also, although there are a few oddities, like dialog boxes seem to pop under the main window and lock up the display until you press escape. Other than that. so far, it’s pretty much as you describe here. Yes I had the same experience too. The things with the dialogue box only happened the once to me though, hasn’t been a problem since. 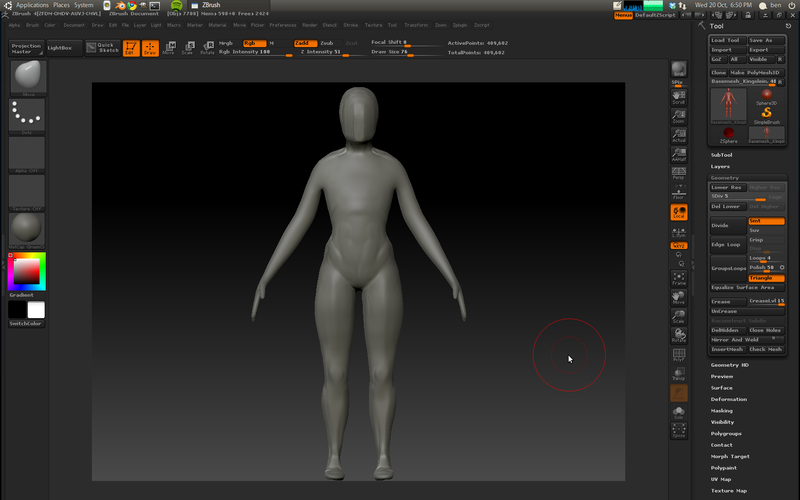 Just got to make sure zbrush isn’t taking up your whole screen I think. Oh I should mention I am using Wine 1.2.3. I tried Wine 1.3 and ZBrush never fully loaded and I had to “Force Quit” the application. I had that problem, too. I had installed originally on wine 1.2, but upgraded to wine 1.3 for something else and zb stopped working so I switched back to 1.2. Though I’ve now upgraded to 1.3 again and did a fresh install and I’m having no problems. Hey guys, just for the record I installed ZBrush 4R2 on Ubuntu 12.04 using wine 1.4, and I didn’t experienced none of the problems listed here! It only take some time to load, but besides that, everything works like a charm! Maybe it got easier to run this application under Wine!